^Compelling evidence that the Bible is God's Holy Word. 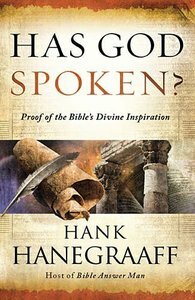 ^Using the memorable acronym MAPS, radio host and biblical scholar Hank Hanegraaff masterfully reveals four proofs that confirm the divine origin of the Bible. M represents the strength of the manuscript itself as many actual fragments have been located A stands for the archaeological proofs that have been uncovered P is for the prophecy that has accurately predicted events S for the scriptural synergy found in the unity, consistency, and harmony of the sixty-six books ^These clearly presented proofs provide powerful indicators that confirm the trustworthiness and divine nature of Scripture, that God has indeed spoken, and that the Bible is the reliable repository of His words.